Following on from earlier posts about the density of rights of way in Norfolk, the map below highlights those parishes with the least dense networks of rights of way and those with no footpaths, bridleways or byways. Parishes shown in white are those with no public rights of way (in terms of footpaths/bridleways/byways). Parishes shown in blue are those with the least dense networks of rights of way. A typical characteristic of these parishes is the presence of single dominant landed estate, often with a large park that accounts for most of the area of the parish. 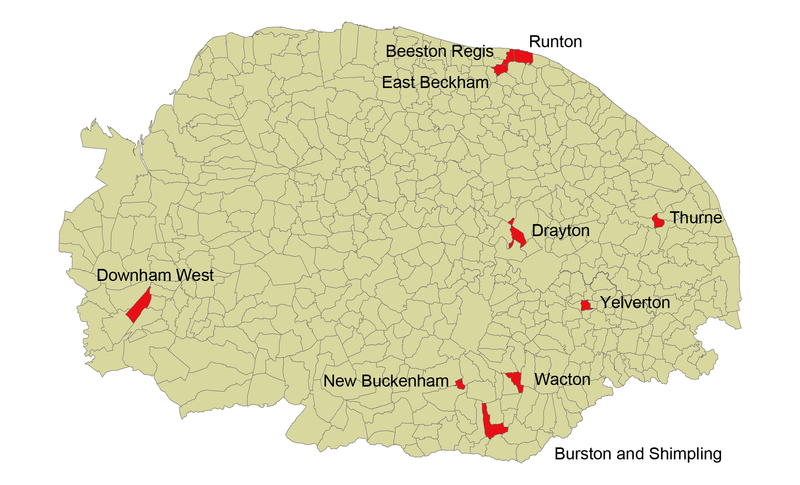 Anmer, Beeston and Houghton, for example, are all parishes where landscape parks dominate the landscape. The movement and closure of rights of way in the eighteenth and nineteenth centuries to create such landscapes is well documented, although will be the subject of further research as part of this project in terms of chronology and distribution. Other factors such as settlement shrinkage/desertion and military requisitioning (Stanford and Sturston) also loom large in the history of these parishes. The following parishes all contain some rights of way, but in terms of density account for the 10 least dense networks in the county (excluding those parishes with no rights of way). These parishes continue the predominant east/west divide seen across the county and again the presence of large landed estates in the eighteenth and nineteenth centuries seems to be the key factor in most cases (e.g. Hilborough, Kilverstone, Sandringham). However, the figures are also misleading in some ways. For example Sandringham today is, by Norfolk standards, a very large parish covering over 4,000 hectares (making it the fifth largest in the county) and contributing to its low density value. Furthermore this fails to take account of the land which is now accessible to those visiting the Sandringham estate; or the nature reserves at Dersingham Bog and Wolferton Fen. 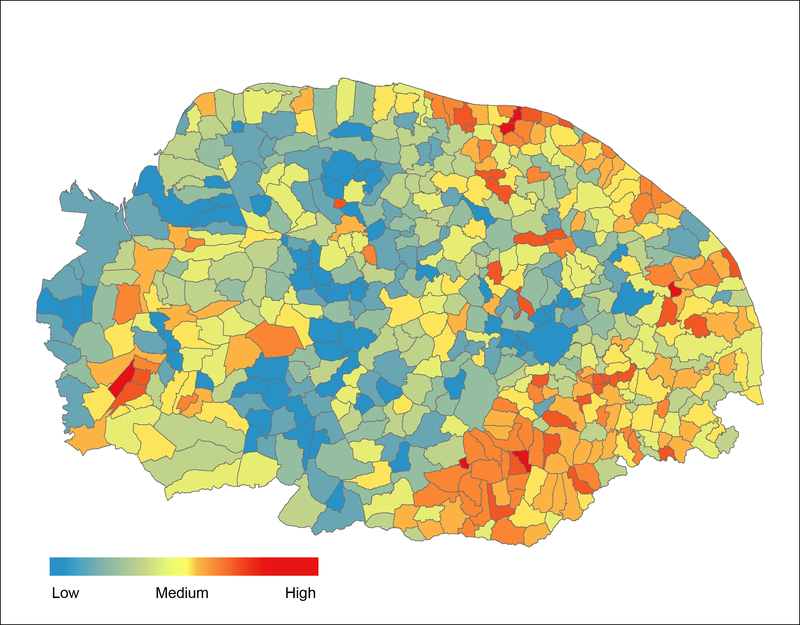 Following on from yesterday’s post, these maps show patterns of density across the county, this time taking account of roads as well as public rights of way. In each case the density of routeways has been worked out in terms of metres per hectare. 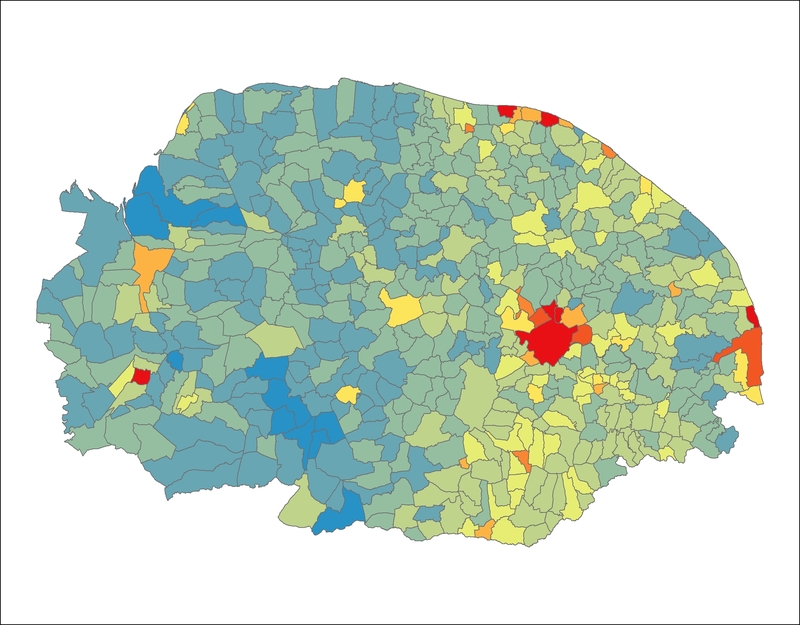 Density of public rights of way in Norfolk. Blues and greens = low density; oranges and reds = high density. Combined density of Public rights of way and public roads. As research and mapping progress we hope to be able to look in more depth at changing densities over time. 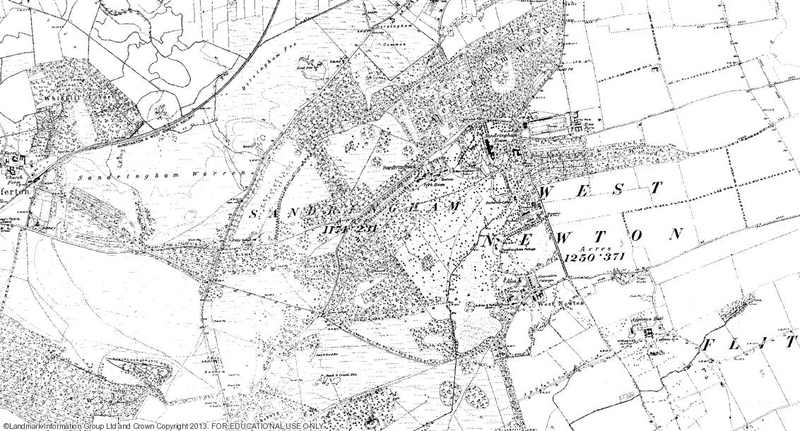 It has already become clear from examining seventeenth and eighteenth-century maps of a number of places that processes such as parliamentary enclosure could dramatically reduce the number of paths and roads within a parish. However, in some cases similar processes are evident even in parishes which were untouched by enclosure acts. When looking at patterns of rights of way across Norfolk some are unsurprising, such as the greater number of footpaths and lanes in the south east of the county and the relative sparseness of the north west. Examining the historic development of such contrasts will form a key part of our Pathways to History project, but as we sort through the results of fieldwork and documentary research we’ve started to explore and map a range of other patterns. Firstly, we’ve been looking at the modern density of rights of way (footpaths, bridleways and byways), calculated in terms of metres of rights of way per hectare of each parish. On this basis the densest network of rights of way is to be found in the parish of Wacton, to the west of the A140 near Long Stratton. Anyone who has ever looked at an Ordnance Survey map of this area won’t be surprised by this – the mesh of paths and tracks across and around Wacton Common is striking even in an area with as many footpaths as south Norfolk. It might reasonably be expected that the other most densely ‘pathed’ parishes in Norfolk would be in this area, but the distribution of the top ten is rather more widespread. 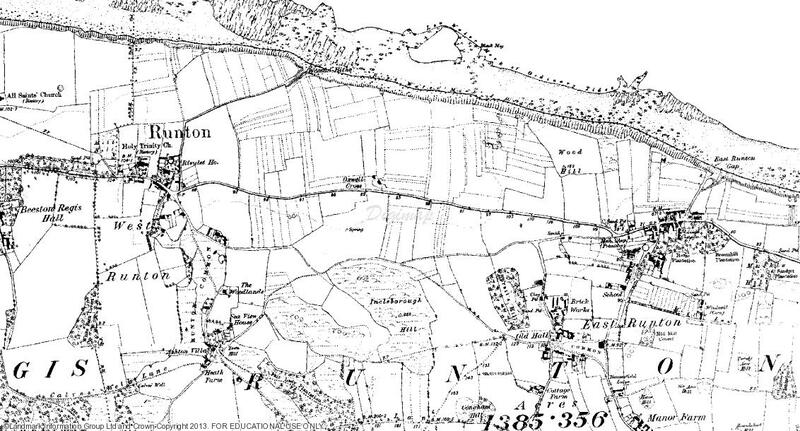 Strip fields around Runton on the north Norfolk Coast as shown on the OS 6″ to 1 mile map of the 1880s. Further research, both fieldwork and documentary, will undoubtedly shed more light on these patterns; and on the more detailed history of rights of way within individual parishes.